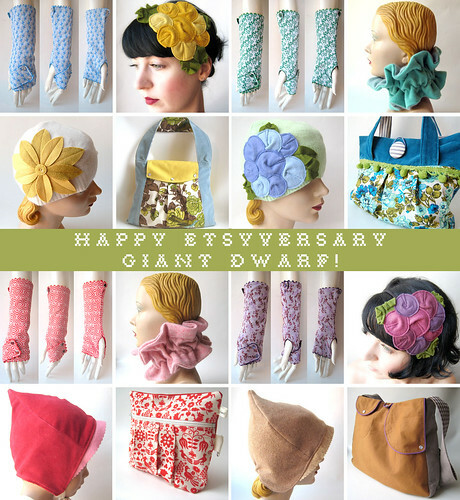 Today is a huge milestone for my tiny company, Giant Dwarf! Four years ago today, I joined the most amazing website to sell the things I make by hand. Yes, that would be Etsy and I haven't looked back since I signed up. I met Rob Kalin, Etsy's founder, at the very first Renegade Craft Fair in Brooklyn. He was handing out fliers to all of the vendors + telling everyone about this new website he was starting called Etsy. If I remember correctly, I think he said it was like eBay, but for handmade stuff. I may be totally making that up, but that's how I started explaining it to folks when I began to spread the good word about the website, so I think that's how I remember it. Anyway, I signed up after thinking about it for a few days, and in less than a couple weeks, I had sold my first item. It was a W.W.T.W.D? t-shirt. I love that there is an archive of everything I've ever sold over the years. It's like my year book of crafts + my feedback is like the autographs I've collected from each sale! To celebrate my Etsyversary, if you will, I'd like to propose a little giveaway to you, dear reader! I'd like to put together a series of little gifts to give out to four lucky readers, to commemorate four years of virtual craft slinging. All you have to do is leave a comment telling me which Giant Dwarf design is your favorite or what you'd like to see me create in the future. I'll pick my favorites on Friday, July 10th and announce the winners on Monday, July 13th. Wow, how to choose just one thing! I too can remember when I first stumbled across your little store and was totally smitten with the cloche hats! Everything you make is so lovely, and I especially love the colour ways of your newest fascinators so I am going to have to go with them as my favourite, I absolutely love them! Congratulations on 4 years, I am so pleased for you! The design of Giant Dwarf that I love is the Rosette Fasciator, the thing is because I only have one of your product thus far. I love love the color (I have in gold) and the design, such a very great combination. It seems to me that you put all your effort into every pieces of your items. Also, the details and craftmanship made me really impressed. I just hope that you will design hair-piece that can wear everyday and every season, esp since I'm going to move to another country where it's more humid and rain rather than snow and cold. I am new to your amazing handmade designs! I am wondering if you have considered doing a toddler line? I have a G-Bebe 4T and I could so envision a hat, dress, and purse for her! I am mad for fingerless gloves,but living here in the desert, gloves are not needed until October. Truly everything is just BEAUTIFUL! congrats! i must say, i love your little felty flower-y fascinators. although i am a PINK girl, there's something about the aqua color of the 'parrotlet' that really tugs at my heartstrings. pretty pretty, bien sur! future-wise, i would love to see ear-muffs made from the rosette fascinators...a little cluster of rosettes on each side to keep ears warm in frosty weather. cute and functional. yay! best wishes for many, many more successful years! the valentine version of the rosette fascinator. it is my favorite of favorites. i'd slide it on my head & BEAM the smiles of all smiles i'd be so pleased to wear it & my blonde hair would also smile because it loves the color red more than anything. happy 4 years of marvelous creations. I have a Snappy Satchel - Audubon Society with a few custom specifications & I absolutely adore it. I've even thrown it in the washer a time or two when the straps have were dirty from my grubby little hands and there isn't a loose thread on it. My husband was just commenting yesterday that I've used it longer than he's known me to use a bag - almost a year now & still going strong. It was fun to inform him that the t-shirt he was currently wearing, and quite possibly his absolute favorite, "Beards not Bombs" was also made by you. Fun contest! As a new fan of Giant Dwarf (saw you for the first time at the art star bazaar this year!) I am in LOVE with the Rosette Fascinator. I haven't found anything else like it & it's just so adorable! congrat's!!! :) 4 years and counting. that's amazing! Hi & Congrats on 4 years! YOu are an inspiration! I love your work, too, and must say that I am really intrigued by those gloves on the large picture - I want to see them up close, and can imagine that I would LOVE the fabric. I also love the rosette headband look vs. the elastic fascinator - as I think I would prefer a smaller bit of flash/flair with my style....the "romantic" colorway is my fave. congrats!! your work is really amazing!! I love everything!!! :D best wishes for many more successful years! I absolutely love your bags! Keep up the great work! you create so many beauties but your fascinators are so very darling!!! i love the rosette fascinators, especially in the yellow, ivory and brown color ways. 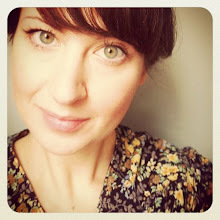 i am also smitten by your fabric covered buttons on your flickr page! i would love to see some of your own fabric designs one day. but also, since fall will be here before we know it, maybe you can come up with some more cute hats in brown and red felt- something like the little elf bonnets with the lace trim in your etsyversary picture above. and what about some rosette brooches or pins? i am excited about this giveaway!!! You also inspire me to get out there and be creative. Thanks and keep doing the lovely work you do. congrats!! i love the wool i got from you @ art star... i think my favorite thing in your shop were the Snappy Satchels... i look forward to seeing what you come up with in the future! I just came across your stuff on etsy, love the rosette fascinator (the swan)! congrats on your etsyversary! I LOVE the rosette knit cap...esp in the blue hues. Maybe tiny little rosettes on bobbies or something small and everyday would be something fun to see. I just love those little flowers and I have super short hair so bobbies are always on my mind!! Congratulations on your four years. I remember when I started on etsy, you were one of the first sellers to catch my eye...great stuff! Keep it up. i am in love with your Rosette Fascinators! they are so beautiful and you look gorgeous wearing them! i would love to see you creating Rosette Fascinator Tees! you can make them as brooches or sew them directly to the tee. i am crossing my fingers for the giveaway ... all of them, LOL! Your snappy satchel's are my favorite, I love the colorful fabrics together. Congrats on 4 years! i've also already told you that you should bring the Coronette headband back. it would be great for the holiday season! Happy 4 years!!! How wonderful! I love your rosette fascinators the most. They're great for ladies with short hair and create an adorable look without much effort - which I love. I hope your next four years (and more!) are just as fantastic! First of all, I like going on your Flickr and seeing you model your latest vintage acquisitions. Your latest one (the red dress) is adorable and I love the red stockings you paired it with. My favorite is the Rosette Fascinator in Swan..so elegant. And I do miss the Snappy Satchel. They are so bright and lovely and..I am sure..take a lot of tedious time to make. I must say, I came across your shop while i was looking for wool felt. I'll probably come back again some time for a purchase. Thanks for the giveaway! My favorite Giant Dwarf design is the Rosette Fascinator. I have one in peacock, but I really like the sweetheart color scheme also. It's hard to say what I'd like to see in the future, but I think a tote that coordinated with the fascinator would be fun. Hello there :) I have just been window shopping (well, screen shopping i guess :P) through etsy to find things to spend my birthday money on! I spotted your lovely head bands and they remind me of the gorgeous hydrangea i have in my garden (odd i know but i love those flowers!) I've looked through your items and past sales and love your vintage style, it is so inspiring and i just want to get one of everything! The first thing i spotted were your headbands, but then i saw your glovettes and bags and just wanted to hug my laptop! Personally i think my favourites are your messenger bags and your fascinators :) And i would love to see a messenger bag in recycled linen? or a lovely fruit theme! I have abit of a thing for apples at the minute :P. Congratulations on having such a successful account, I'm sure you will get alot of comments here!! It's hard to choose one favorite! I think I would have to go with the Rosette fascinators. They are incredibly beautiful and well made and original! Break out the cupcakes and blow out the candles! Yay for four years of creative goodness. I just found your shop and am anxiously awaiting the arrival of my first fascinator. I'm in the Philly suburbs and was delighted to discover that you're local :) I laughed when I noticed that you'd sold via Anthropologie because your craft fits right in with their classy, unique items! Two things I'd love to see from you: pins and Christmas ornaments. A tree trimmed with your beautiful work would set the perfect festive mood! I am really loving the Rosette Fascinator in Flamingo. It's so bright and hot pink and looks really great with dark brown hair! keep up the great work, it's always lovely seeing you at craft fairs. i have a knitting t-shirt i bought from you at the bazaar bizarre here, and it i my favorite, but i do love everything that you do! I'd love it if you started making Rosette Fascinators for babies/kids! My daughter desperately needs one! oh congratulations!!! i really love your headbands, the collection of colors in each one is beautiful and i love the arrangements... oh so pretty! in the future... i say do whatever you are inspired to do!!! i love seeing people create things that are their translation of something. im crossing my fingers hard!!! i absolutely love love love your Rosette Fascinator hair accessories!!! they are beautiful!! i always love a good head piece!! !